The following exercice aims at illustrating the importance of air transportation in the greenhouse gases emissions. It is just an illustration on a practical case, but the purpose is broader : the goal is to expose the importance of these emissions and to suggest that it might not be opportunate to try to preserve the growth of this sector. A long range plane, for example the A340-600 from Airbus, can seat 380 passengers in “normal” configuration, in three classes (below). It can otherwise fly over 13.900 km and requires 194.800 liters of fuel for that (data given on the web site). This last point is important : if the plane is not full, the consumption per passenger.km increases, well the average filling rate of planes is not of 100% but closer to 70%. Practically, the real consumption per passenger is about 6 liters per 100 km. On the other hand if the plane is not used over its maximal range, as take-off and landing are proportionnally more fuel consuming, the consumption per passenger and per kilometer increases significantly . And at last the most ancient planes are also the most gas-guzzling. The following calculations might therefore constitue a low value for what I am trying to expose. The average distance for a long range trip (or international trip) is 6.495 km (data from the english Department of transportation). Over such a distance, and supposing the plane is full, a passenger thus consumes 0,037*6495 = 240 liters of de kerosene, that leads to emissions of 165 kg carbon equivalent for the sole CO2, and actually twice that amount, that is 330 kg carbon equivalent, if we take all greenhouse gases into account (see below). Hence each person travelling by plane emits about as much greenhouse gases as if he(she) drove over the same distance in a large european car. Passengers : greenhouse gases emissions per passenger.km, depending on the transportation means, in grams carbone equivalent. It is easy to see that cars and planes emit the same amount per passenger over the same distance. A calculation of the same nature indicates that fort a short range flight (or domestic flight, wih an average distance of 500 km in the world) a passenger consumes about twice as much and emits on average 25 kg carbon equivalent (for 500 km) for CO2 only, that is 50 kg all greenhouse gases included. Each passenger on a short haul trip emits as much as if he was driving the same distance in urban trafic ! Of course, the emissions induced by a single flight are then very important. 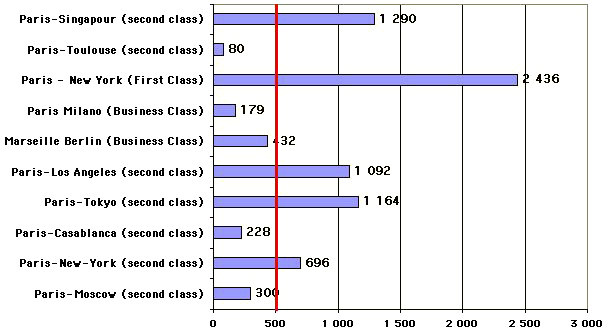 Greenhouse gases emissions by passenger and by class (all gases included, in kg carbon equivalent) for a couple of examples. The red bar represents the maximum CO2 emissions per person and per year that we must achieve on a worldwide basis to stabilize the atmospheric CO2 concentration in the atmopshere. Obviously tackling climate change is not compatible with a “democratic” access to air travel..
Should France build a third airport near Paris ? Then Aéroports de Paris (ADP) gives the following statistics for the passenger trafic of the Paris airports (Orly and Roissy) in 1999. We can see on the above table that international flights grow faster (9% in average) than the domestic ones. Otherwise thhe domestic flights represent only one third (roughly) of total flights arriving to or departing from Paris. 292 (let’s say 300) million passengers for international flights, that is 80% of the total. Without holding for valid the absolute figures (300 million passengers, brrrr…) it seems legitimate, in the rest of the calculation, to suppose that 80% of the passengers using the new airport would take an international flight when this new airport reaches its maximum capacity. 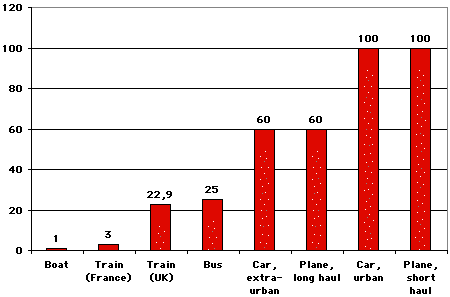 Making this supposition is also backed by the fact that in a couple of decades (and in a constantly growing world) most french cities would be under 3h30 by train (a plane trip, all included : going to the airport, checking in, undergoing delays !, leaving the destination airport, etc is seldom taking less than 2 to 3 hours). for long-haul flights, 40 (million passengers) x 330 (kg carbon equivalent per flight) = 13.200.000 tonnes carbon equivalent per year. Total : 13.700.000 tonnes carbon equivalent. In this total, I did not include the emissions of 100% cargo planes (I don’t know their number). Knowing that a French person emits around 2,5 tonne carbon equivalent per year, it means that building a third airport near Paris is enabling the equivalent of the emissions of 5,5 million French ; it’s almost the equivalent of 10% of our national emissions in 2001. Even an airport limited to 25 million passengers per year would still represent 5% of our national total. The emissions I refer to here are of course those of the planes over the whole length of the flight. It is therefore totally incoherent to wish at the same time to fight against climate change and to build a supplementary airport. Generally speaking, it is totally incoherent to wish at the same time a mitigation of climate change and the growth of air trafic through building or extending airport infrastructures. The little reasoning exposed above could of course be applied to the extension or building of any airport in the world. Of course, the growth of air trafic – to which no explicit limit is assigned today – is the primary reason for the growth of emissions, not the increase of airport infrastructures as such. But the link from one to the other is obvious when the existing infrastructures are saturated, which is more or less the case today. More generally, what is air trafic worth in the total greenhouse gases emissions? For the sole CO2, air trafic generates roughly 2% of the world total, that is the equivalent of the emissions of United Kingdom, which is not nothing. But planes are also important sources of other greenhouse gases (water vapour, ozone…, see figure below). The percentage is therefore higher if we take all greennhouse gases into account. 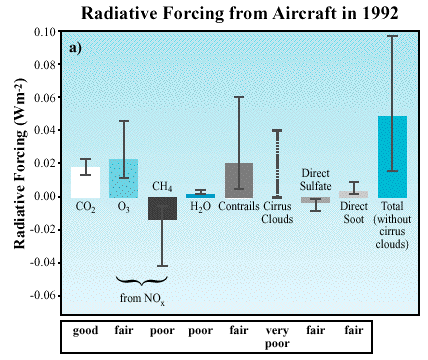 Radiative forcings due to air trafic in 1992. the words on the lowest line (good, fair ,etc) give the level of scientific undertanding on the involved processes. We can see that the total for planes is close to three times what it is for the sole CO2 (if we “piled up” the upwards bars one on top of the other, then deducted the bars that go downwards of methane and sulfate, we would end with a bar roughly 3 times higher than that of CO2), when for all human activities in general this ratio is close to 1,5. Air transportation therefore contributes to something which is closer to 4% of the world total of all greenhouse gases. In addition this trafic grows between 5% and 10% per year (with little hiccups, sometimes, but the main trend is there for the time being) : the high scenario of the IPCC corresponds to a multiplication by 15 of the CO2 emissions in 50 years, what would bring air trafic above the present level of the USA (that generate 25% of the world total in 2000). It is therefore something that is far from negligible for the future, and in addition the emissions coming from international air trafic are not taken into account in Kyoto (officially it is for methological difficulties, that, indeed, are not minor : which country “owns” the emissions of a swiss passenger that would take British Airways to go from Paris to Moscow ? ).